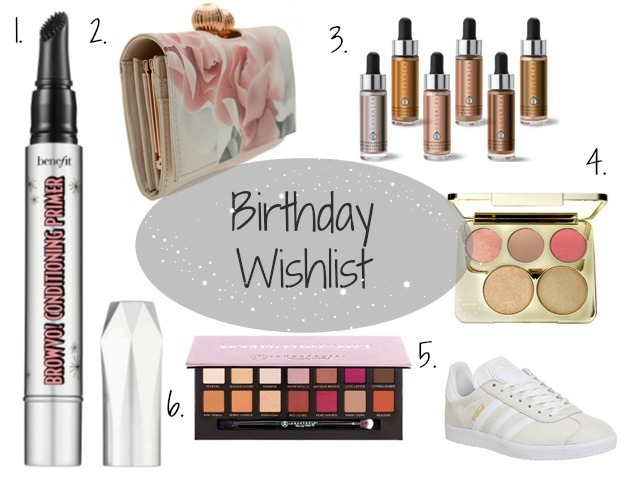 With my 22nd birthday coming up in just under a month, I thought it would be a perfect time to share with you my current wishlist. This time I haven't kept it strictly beauty related just to change things up a bit! This definitley sounds like a gimicky and totally unnecessary product to have and to be honest, if I hadn't seen it being used I would have totally agreed. But after watching Shaanxo's latest 'bombshell' video, I was really surprised at how well this worked! I could see that this product alone actually made her brows look really pretty and natural. With the weather recently being particularly hot, my brow gel doesn't stay on as long as it used to and I think this primer could be my solution to this problem! I adore this purse - everything about this is perfect! I love the colour, the style, the clasp, the floral lining. It's so just cute! I ideally like my purses to have more card slots because lord knows that I have a loyalty for pretty much every shop on the highstreet! BUT for a purse this cute, I think I would be willing to compromise! One of my best friends has a similar purse by Ted Baker with the same claspe design and it does look a little bulky - so perhaps it isn't the most convenient purse, but hey ho! I don't know if this link is a legit purse! But there's this one that I like just as much on the actual Ted Baker website. Again, another popular product out there. I have to admit these terrified me a bit when I first saw them. They are crazy pigmented and I know everyone says it but they do really look like 'liquid metal'. But despite them being crazily pigmented, something about them is calling my name and I do love a good, strong highlight so I'm sure I would get good wear out of these. I don't actually know which colours would best suit me, but I like the look of moonlight and sunlight. I know this isn't really new as such and the champagne pop highlighter by Jaclyn hill has been out for a while now and it's probably the most wanted thing on here! But recently I popped into Space NK in St Pauls and I swatched champagne pop and I was pleasantly surprised with the pigmentation and the colour. I really liked it and I said to myself that when I get myself a new job, I'll treat myself to this highlighter. BUT, I checked out the face palette and for about £16 extra you could get 4 additional shades! So I think it only makes sense, I know it's quite a lot but hey, it's just too pretty not to! I love girls who can rock trainers with pretty much any outfit and as much as I'd like to be one of those girls, I don't think they actually suit me much! But I've had my eyes on these Adidas Gazelle shoes for a while now and I just really love them. I particularly like the ones in the off white colour with gold writing. I don't know if getting trainers in such a light colour is a good idea, but I think it would be perfect for those casual, 'ripped jeans and loose tee' kind of days! This palette has been getting a lot of hype over the beauty world recently and after seeing Anna from Vivianna Does Makeup use it and seen the pigmentation, I know that I want it desperately! I adore the colour range from this palette. It's got a nice mix of neutrals and bold pinks and purple colours which I actually don't have anything like! This is probably my number one wanted product for my birthday! 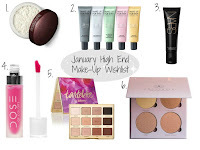 If you want to see my previous wishlists, click on the pictures below! The Battle of Brow Pomades..